Lying on a bed is a tiny malnourished child. Her limbs wasted, her stomach bloated, her hair thinning and falling out. Her name is Roshni. She stares, wide-eyed, blankly at the ceiling. Roshni is six months old. She should weigh 4.5kg. But when she is placed on a set of scales they settle at just 2.9kg. Roshni is suffering from severe acute malnutrition, defined by the World Health Organisation as weighing less than 60% of the ideal median weight for her height. There are 40 beds in this centre. On every one is a similar child. All are acutely malnourished. Wailing, painful, plaintive cries fill the air. This is the Nutrition Rehabilitation Centre in the town of Shivpuri. You might think we are somewhere in Africa. But this is the central Indian state of Madhya Pradesh - modern India, a land of booming growth. "The situation in our village is very bad," says Roshni's mother, Kapuri. "Sometimes we get work, sometimes we don't. Together with our children we are dying from hunger. What can we poor people do? Nothing." The lunchtime meal of boiled eggs, milk and porridge is handed out. Another mother is cradling her daughter, trying to feed her. The girl's name is Kajal. She is two-and-a-half years old and so weak she can hardly eat. Her mother tries to spoon some milk into her mouth. It dribbles down her chin. Kajal barely even opens her eyes. Kajal's skin is pale. Her breath comes sharp, shallow and fast. She too is suffering from severe acute malnutrition. Her weight is 6.7kg. The nutrition centre here was set up by the United Nations Children's Fund (Unicef). Doctor Vandana Agarwal, Unicef's nutrition specialist for Madhya Pradesh state, points to Kajal's swollen little feet. "There is oedema on both the feet, scaly skin on her legs, even her respiration rate is high," Dr Agarwal says. "The child is in a lethargic condition, her hair is thin, sparse, lustreless, easily-pluckable. These are the typical symptoms of protein energy malnutrition." 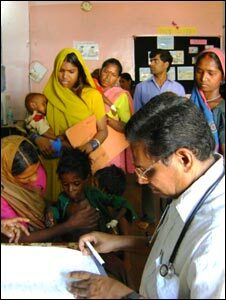 India has some of the highest rates of child malnutrition and mortality in under-fives in the world and Madhya Pradesh state has the highest levels in India. There are around 10 million children in the state. A decade ago 55% were malnourished. Two years ago the government's own National Family Health Survey put the figure for Madhya Pradesh at around 60%. So why is it going up? "It's basically inadequate access to food, poor feeding practices, poor childcare practices," says Dr Agarwal. In Madhya Pradesh the situation is compounded by two significant factors. For four years in a row the rains have failed, so food crops have failed too. And now global food prices have risen, stretching many families beyond breaking point. "In the past year food prices have increased significantly, but people's incomes haven't improved," says Dr Agarwal. "Like wheat, earlier they used to buy it at eight rupees a kilogram, now it's 12 rupees." "Because of the increase in food prices a mother cannot buy an adequate quantity of milk, fruits and vegetables. So their staple diet has become wheat chapattis," she explains. "A child cannot survive on wheat chapattis alone. About 80% of mothers and children are anaemic because they can't get good quality food." The village of Chitori Khurda is a ramshackle collection of 80 stone and mud huts on a rocky plain. The villagers here come from the bottom rung of India's social scale. 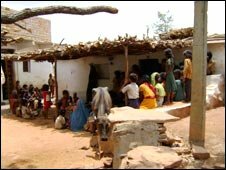 Among the lowest of the low in India's caste system are the Scheduled Tribes, just above them come the Other Backward Castes. Together they make up 95% of the population of Chitori Khurda. Even here, in this desolate spot, caste matters consign the lowest to the harshest existence. Chitori Khurda village has no water supply. There are four wells in the fields around, but all belong to higher caste owners who often refuse to let the villagers use them. So these are the people worst hit by rising food prices. They have little land of their own. What they do have is the least fertile, sometimes far away. Without water they cannot irrigate, so they cannot feed themselves. And out here there is not much in the way of work either. The men of Chitori Khurda get odd jobs labouring for higher castes or just play cards all day. The women sit outside their houses sorting green leaves they have gathered into small bundles. The leaves are sold to make local cigarettes. But it does not earn much. So in almost every home people are going hungry. Unicef says 79% of the children in this village are malnourished. Siya showed me her house, crouching to get in through the low door, we entered a stifling-hot, single room where the family of six live. Siya picked up the can where she keeps her flour. It should hold enough for a week's supply. There were just a few cupfuls left. 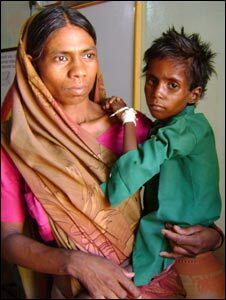 Her two youngest children, seven-month-old Anjali and two-year-old Aseel, are both severely acutely malnourished. The family can afford to eat only twice a day. The children chewed slowly on a few chapattis flavoured with a tiny bit of onion and ground chillies. It is all they have to eat. Siya's husband works as a bonded labourer. He is still trying to pay off a loan he took out 15 years ago. In theory the government provides 30kg of subsidised flour a month to every poor family. But corruption and inefficiency mean the system often does not work. Even with the full allocation a family like Siya's would have to buy an additional 90kg of flour a month at a cost of more than 1,000 rupees. Siya says several days a month the family has to go to bed hungry. "The children cry and create a commotion," she tells me. "I go door-to-door until somebody gives me a little." Madhya Pradesh is trying hard to tackle the problem of malnutrition, but it is getting worse, not better. Corruption and inefficiency hamper the system. Some Anganwadi workers skim off food to sell. 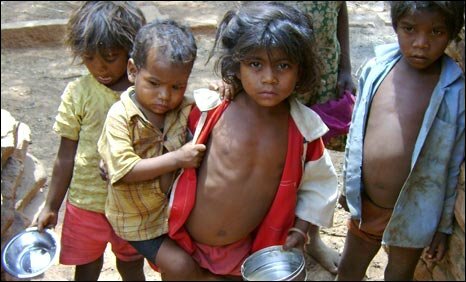 Others refuse to give food to lower-caste children. Many simply do not turn up as they are not paid much for the job. Add to that high food prices and the poorest are sliding into hunger. 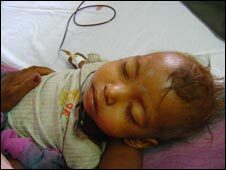 Back in Shivpuri, two-and-a-half-year-old Kajal had to be transferred to hospital. Her condition was so serious, she was so anaemic and her haemoglobin levels so low that she had to have an emergency blood transfusion. Lying in her hospital bed Kajal was reviving, slowly. Her mother, anxious, looked on, a pressing question weighing on her mind. Kajal should survive, but how will she feed her child?